Described by Flying Magazine as a jet with a prop, the Daher-Socata TBM 700, 850 and 900 aircraft deliver jet-like speeds on a more economical budget. The six to eight seat, pressurized turboprop aircraft was first introduced in 1990 and has been going strong ever since. With a service ceiling of 31,000 feet a TBM can soar with the “big dogs” over hazardous weather and quickly to a destination at 330 knots true airspeed. Newer models are loaded with the latest glass cockpit technology and creature comforts such as air conditioning, TBM aircraft will make just about any pilot drool. TBM 700A – The TBM 700 started it all, cruising at 300 knots true on a Pratt & Whitney PT6A-64 engine. 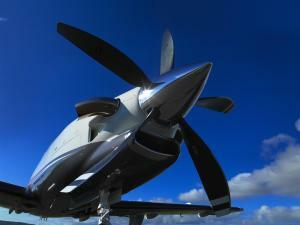 The TBM 700B and TBM 700C followed with increased maximum weight, air conditioning, and other available add-ons. TBM 850 – With an extra 25 knots at cruise altitude, the TBM 850 brought pilots more speed, without altering what made the 700 a success. The TBM 850 G1000 was the first TBM to be equipped with the G1000 glass cockpit system and the Elite model offered increased cargo and forward facing passenger seating. TBM 900 – To date, 47 TBMs have been ordered in 2014. Dubbed the “ultimate personal aircraft” the TBM 900 boasts a 1,730 nautical mile range, can hit 31,000ft in just 18 minutes, and can land on 2,100’ grass runways; all without compromising the luxuries. Besides the 330 knot maximum cruise speed, other improvements include composite winglets, a five blade propeller, automated pressurization control and Garmin V14 software. Experienced TBM owners, prospective TBM owners and transition pilots all benefit from a call to Aviation Insurance Resources (AIR). The aircraft insurance experts at AIR shop all of the major aviation insurance markets to obtain you the best rates and the broadest coverages available. Turboprop pilots owning aircraft such as the TBM 900, Pilatus PC 12 and the Cessna Caravan have been depending on AIR’s turboprop insurance experience since 1999. From piston to turboprop aircraft to jets, the agents and pilots at AIR have you covered. Just one call can save you time and money. To insure your Daher-Socata TBM aircraft, please contact Aviation Insurance Resources by calling 877-247-7767 or visit AIR-PROS.com today to request your aviation insurance quote online!